The two things that make me happiest in my life are doing anything with my kids (yep, I’m that mom) and feeding people so much food that they feel the need to stuff themselves to the point of unbuttoning their pants. This is why I will never complain about my husbands friends coming over every week. I get to feed them. This week I defiantly forced a couple buttons as I fed them bbqd pulled pork nachos. You heard me. BARBAQUED PULLED PORK NACHOS! These are devine and I make pulled pork just so I can make the nachos. 1/3 c cilantro, diced Mix together to make your pico and season with salt and pepper. Set aside. 12 oz cheddar cheese, shredded Scatter over chips. Throw your finished tray of chips under the broiler for 5-8 min. 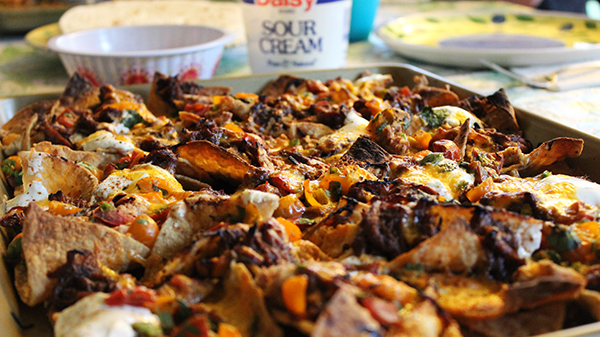 Categories: Good food, Recipes | Tags: BBQ Pork Nachos, Casual dinner for friends | Permalink.